This dish makes an delicious make-ahead breakfast (just fry the eggs when you’re ready to eat), or a great weekend brunch recipe. In fact, this would also be good for a quick dinner! I’m not a huge brussels sprouts fan, but these babies are cooked in bacon fat, which is the key to making anything taste good, right? Note that when it comes to gathering your ingredients, you have to use sugar-free bacon to make this Whole 30-approved. I also used organic, free-range eggs, organic brussels sprouts, and an onion from the farmers market. 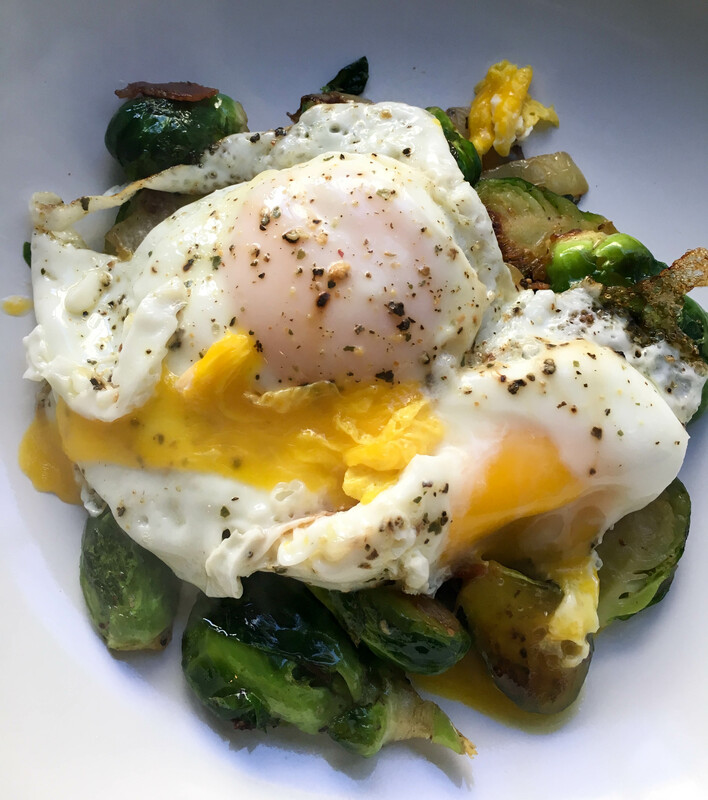 Enjoy the recipe, share it with other brussels sprouts skeptics, and if you’re doing the Whole 30, let me know how it’s going so far! Transfer bacon to a paper towel-lined plate and chop into small pieces. In the same skillet with the bacon fat, add the brussels sprouts and onion, and season with salt and pepper. Cook until spouts are tender and golden in color, stirring occasionally, about 10 minutes. Add bacon bits back to skillet for another minute or so while you fry eggs in coconut oil in a second pan. Top brussels sprouts with eggs and serve immediately. Thanks! Hope you enjoy it and have a great weekend! I just had the leftovers for lunch today. So good!